I am fortunate to be able to set up a new sewing space in the near future in a room that is 16' x 18', and I have just purchased a new Bernina 750QEE as well. I do need to buy a sewing table to accommodate the machine, but I am not sure which one to buy, I know that not all tables will fit the new Bernina 7 series machines. Any opinions are most welcome- there is the Horn Elite Quilters Dream table with the electric lift or the Koala Quilt Pro or the Koala Quilt Mate, and the made in Canada Eddycrest. All are in the same price ballpark, give or take a few hundred dollars. I have the space for a large table and plan to make a cutting table with 2 Ikea Expedit shelves and a solid top. The room will hold my Tin Lizzie and seven bookshelves for my cook books and sewing books. I will still have about 10 feet of wall space for the sewing table. This is a big purchase and I do want to be happy with how the table works. Anyone have an opinion? Thanks. I've been happy with the Koala for my Bernina 830E. I really like my Horn table. The machine sits down inside on an adjustable lift. Best for ergonomics. Your body will thank you! I found a furniture maker that made two tables for me that hook together. They can be used together or separately - they attached on the long side. One of the tables has lifts installed for my sewing machine and for my serger. I love them and they were much cheaper that a Koala or Horn unit. You already know that I went with the Eddycrest. I did not go with a power lift, as once the adjustable part was set, I would not be needing to hide the machine, or adjust the height. Plus, was it going to be something that would malfunction? I'm thinking that with your having a dedicated space as well, be like me and save the $$ for something else. Go and check out the different brands to compare them IRL . I felt there was more value for the $$ I was spending. Not sure about the other brands re inclusions, but comparing the Eddycrest with the brand out of Edmonton that I considered, for the same money I got a lot more drawer storage space. Plus with it being a custom made order, if you want additional height or depth etc. or other features added, it's do-able. Factory builds can be great, but if you want something to your specs, can become quite expensive, if it is even possible. If it's important to you ... consider the delivery delay. I found a lot of the sewing stores sold the cabinets, but did not carry stock and would take 6-12 weeks for delivery. Eddycrest promised 4 wk delivery max, while letting me know it would probably not be that long ... I had it in less than two weeks! I had a feeling that would happen, and gave him full credit for over budgeting his time, so that if things went wrong, he was not needing to tell me there would be a delay. Last edited by QuiltE; 07-10-2013 at 07:25 AM. My DH made a large sewing/cutting table with an inset for my Bernina 710 from kitchen benchtop material he purchased from a kitchen factory. He made the frame from welded metal so it would be strong enough to cater for the large machine. My advice to you and something I would think of "next time" is that I wish the cutting table were a whole seperate unit. The large amount of table behind and to the side of the machine is great for supporting a quilt but it is totally too low for me to use as a cutting table......after a short while I find my back aching. A friend of mine had a seperate cutting table made that hinged out from her wall and could be dropped down if not in use. It's a terrific height and I wish I had thought of it though I doubt my sewing room would have had room for it. Love my Koala table. My one regret is that I got the model that doesn't have much room on the right side of the machine. The edge of the machine is at the edge of the table. I am one who like to have my things right at my reach so I definitely have some space issues. That is the only negative and that was my fault for changing my mind at the last moment when I ordered my table. 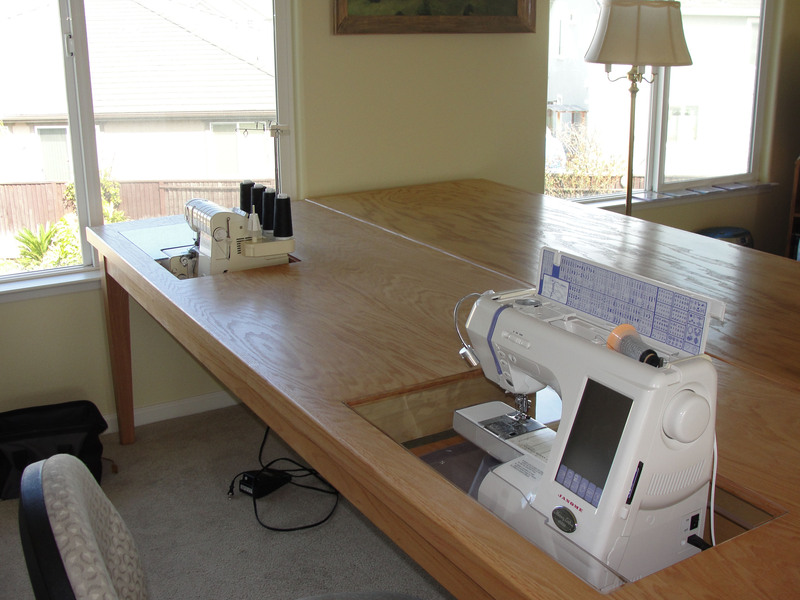 I have the Eddycrest sewing table, it works great with my 6600 and does not have the power lift as at the time I bought mine it wasn't available. he delivered it with his girlfriend and assembled it in the sewing room. This is when he first started making the tables. It is wonderfull with the drawers and extention table also.